Share the post "What Are Capers?" Have you ever thought what the capers are and how they grow? Those salty, pea-sized dark green little things are just pickled flower buds of Capparis spinosa, the caper bush, also called Flinders rose. It is a spiny, trailing, deciduous perennial plant that has rounded, fleshy leaves and large white to pinkish-white flowers. It is native to the Mediterranean, East Africa, Madagascar, south-western and Central Asia, Himalayas, the Pacific Islands, Indomalaya, and Australia. The caper bush requires a semiarid or arid climate. You can buy Capparis spinosa seeds online. The shrub begins producing flower (caper) buds from third year of plantation. They’re too small and delicate to be plucked by machine, so they’re harvested individually. It’s what makes them so expensive. In general, their small cream colored buds are gathered by handpicking in the early morning hours of the day which otherwise would unfold into a beautiful whitish-pink four sepal flower with long tassels of purple stamens. Soon after harvesting, the buds are washed and allowed to wilt for few hours in the sun before putting into jars and covered with salt, vinegar, brine, or olive oil. Smaller sized buds are more valuable than large ones. Non-pareil and surfines are some small buds while capucines, capotes and grusas are sold as big sized ones. 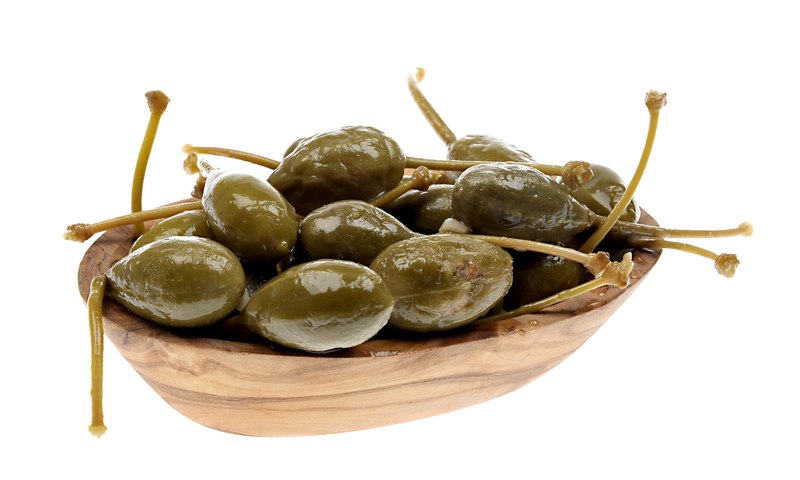 Sometimes capers are allowed to mature to a fruit about the size of an olive. These are sold as caper berries and are brined to be eaten like pickles or olives. It’s common to see them included in an antipasti platter. You can buy capers online or at your local shop. Other parts of Capparis plants are used in the manufacture of medicines and cosmetics. You can buy cosmetics, which contains Capparis spinosa fruit extract online. – Caper parts have been used to relieve rheumatic pain in traditional medicines. – The spicy caper pickles traditionally added to recipes as appetite stimulant. In addition, they help relieve stomachache and flatulence conditions. – Capers are one of the plant sources high in flavonoid compounds rutin (or rutoside) and quercetin. Both these compounds are powerful anti-oxidants. Research studies suggest that quercetin has anti-bacterial, anti-carcinogenic, analgesic and anti-inflammatory properties. Rutin strengthen capillaries and inhibits platelet clump formation in the blood vessels. It also found to reduce LDL cholesterol levels. – Capers contain vitamin A, vitamin K, niacin, and riboflavin. Niacin helps lower LDL cholesterol. Capers are safe to use in cooking. Their use may be limited in pregnancy. Patients undergoing any surgical intervention may have to avoid them as they act as blood thinner and may result in excessive bleeding. 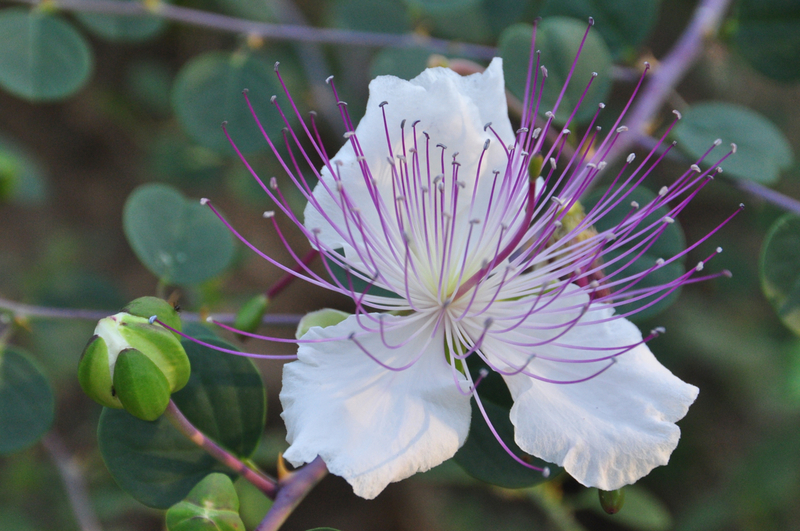 Do you grow Capparis spinosa (Caper bush or Flinders rose) in your garden? What is your experience with this plant? Please share in the comments below! Do you sell Capparis spinosa (Caper bush or Flinders rose) seeds or have plants for sale? You can place your advertisement here. Contact us now!